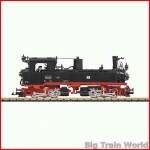 The newly arrived items such as locomotives, wagons, accessories or buildings are listed on this page. This page will be regularly updated. For more information about the product, click the article number. 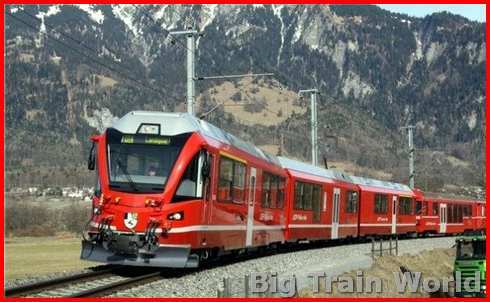 This set is special for the 125 years anniversary of the Rhaetian Railway. The set includes the locomotive “Rhätia”, a passengercar C and two observation car type B2. Not available separately. Coal Container Car of the Deutsche Bundesbahn (DB) from era III. Forney steam locomotive Forney in the execution of the SR & RL. A Start set with many playing options. Consisting of a steam locomotive “Stainz”, a ballast car and a loaded low-side gondola. Material wagon of the workshop in Landquart. 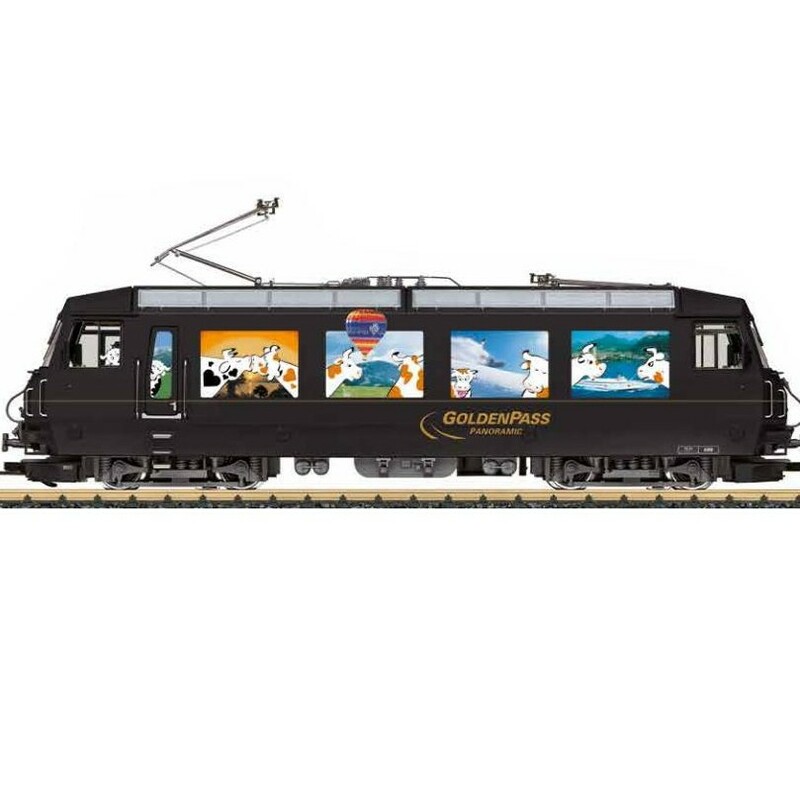 An authentic model with extensive paint scheme and lettering. With original 23 cm big, Steiff Teddy Bear. Baggage carriage of the RhB in the original painting from the 70’s. The high side gondola in the painting and markings of the DR from Era III, with metal disc wheels. Rangier diesel locomotive Köf II of the German State Railroad Company (Deutsche Reichsbahn-Gesellschaf; DRG) in the typical version of era II. A stunning set of 3 newly constructed gondolas. These multipurpose cars were and are used for many different purposes. This model is based on the type Münster 75 O of the Inselbahn Wangerooge of the DB from Era III. 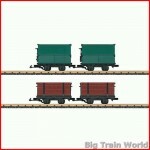 This set consist of 2 individually packed German Reichsbahn (DR) cars from Era IV, type Ow gondolas. The car set is loaded with a cargo real wood which can be secured with the supplied metal chains. This car set consists of 4 cars; 1 stake car loaded with barrels, 2 different high-side gondolas and 1 car with boards for walls. 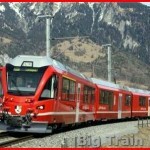 The Glacier express runs from St. Moritz to Disentis on the lines of the RhB. This LGB Model is a prototypical reproduction of a new panorama car, 1st class, Era V.
This service car was built for the new, very modern Glacier Express. German Reichsbahn (DR) E 10 electric locomotive from era III, in steel blue color. This new LGB model is finely detailed and lettered. Equipment car from the DR Wernigerode firefighting train as it looked arround 1979. German Federal Railroad (DB) class 139 electric locomotive in the chrome oxide green basic paint scheme for era IV. This new LGB model is finely detailed and lettered. Wheatered steam locomotive 99 222 of the HSB. A unique version, limited to only 100 locomotives. Maisto’s Humvee military vehicle and Motormax Ford F-150 Supercab. Detailed and reality based. Hartstochtelijke figuren in G schaal, verkrijgbaar in 4 spannende posities. Een pikante en verleidelijke aanvulling voor uw baan. The brand new MM1 oil maintenance pen comes in a 12ml compartment and that is 50% larger than the former LGB oiler, which is no longer available. Beautiful authentic East German farm. The walls are made of weather resistant resin and also from within the farm nicely finished. Beautiful authentic East German barn. The walls are made of weather resistant resin. The MOB (Montreux- Berner Oberland Bahn) owns four locomotives (8001 to 8004) of the series Ge 4/4. The model features the example matching technology. 4-axis RhB The stake car with aluminum sides and stanchions, type Re-w, used in era VI. Container wagon of the RhB, loaded with a removable cooling container with RhB- inscriptions. Car with new car number and detailed container. Prehm starts 2014 with the series, 550001, 550002, 550003, 550004, “relief houses”. Four different townhomes0 are early this year added to the program. 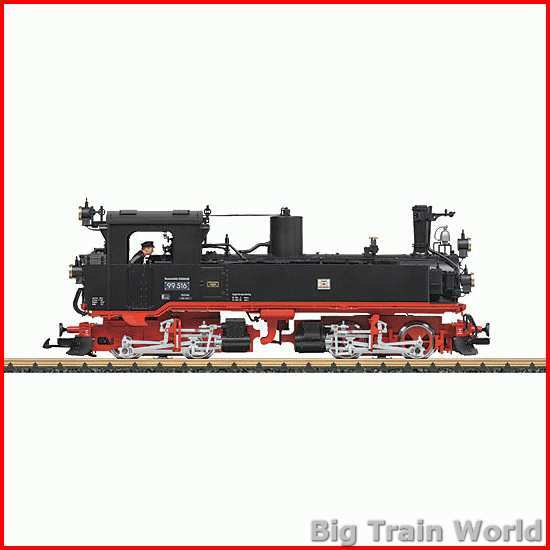 First available in the Netherlands at Big Train World! 3-piece electric multiple ABe 8/12 set of the RhB (Rhaetian Railway). The model is in the condition of the vehicle in the jubilee year, 100 years Bernina railway. The set consists of 4 cars. 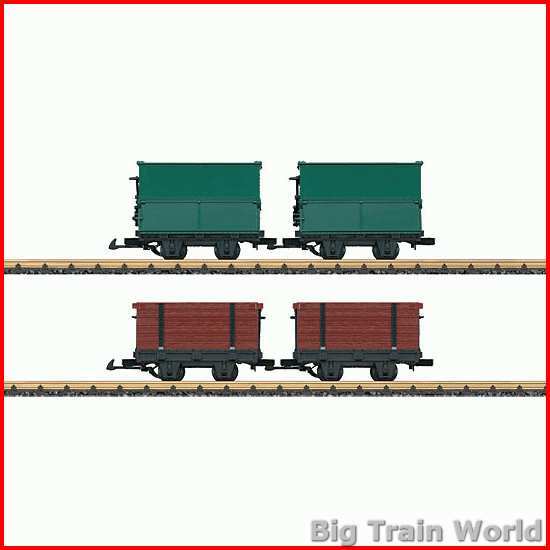 Two rural railroad cars and two high side cars in authentic colors. All cars can be prototypically loaded. By the German army bought in 1917 by Henschel. It was a large and articulated locomotive suitable for the gauge type Mallet, which would ensure a better distribution of the axle loads. The Royal Saxon Railways procured a total of 96 Meyer-articulated locomotives for different narrow gauge lines in Saxony. Many of them are still to see in museums or at the museums railways.